Attending a Kentucky Chamber event is like joining a lively ongoing conversation, where the topic is always pertinent to maximizing business opportunities and the participants are the people who can make things happen. In other words, these events have earned their must-attend status. Our passion for Kentucky and building the state’s business community shapes every aspect of a Chamber event. Attendees hear from nationally recognized speakers and contribute to discussions with Kentucky’s decision-makers, from the governor to top-level executives and business leaders. These events bring together thousands of Kentucky business professionals and civic leaders from across the state — all with business on their mind. Imagine the conversations. Imagine the networking. All Kentucky Chamber events have their own webpages that can be accessed in the menu bar on this page or by clicking the button below. All Kentucky Chamber training seminars and conferences have their own webpages that can be accessed by clicking on Workplace Training in the menu bar on this page. 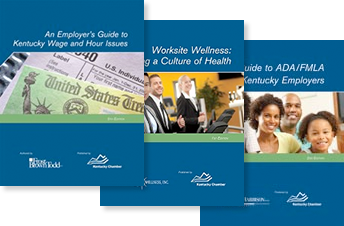 The Kentucky Chamber also published timely human resource guides help you find answers to complex questions…Kentucky and federal mandatory postings help you stay in compliance… and our online resource HRKentucky.com provides these solutions digitally. We have been publishing human resource guides since 1994, and our list of titles is constantly expanding based on what our customers ask for. We like to think that our guides, written by attorney’s practicing and licensed in the Commonwealth and edited so that they are easy to read, are making the lives of those responsible for human resources in their company a little easier. Whether developing your policy handbook, answering wage and hour questions, conducting workplace training or establishing your benefits plan, our guides will legally and practically lead you in the right direction.